The 20mm f/2.8 Alpha E-mount Lens from Sony is a compact 20mm prime lens for the Sony NEX line of APS-C sized mirrorless cameras. Its 35mm focal length equivalent is 30mm which classifies it as a wide-angle lens with multiple applications. 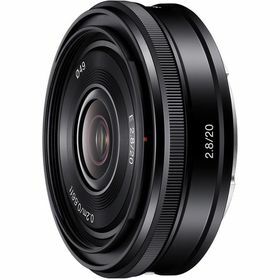 Its maximum aperture of f/2.8 is bright enough for low-light capture and shallow depth of field imaging and its optical design consists of three aspherical elements which correct distortions and aberrations and provide clear, high contrast, detailed images. 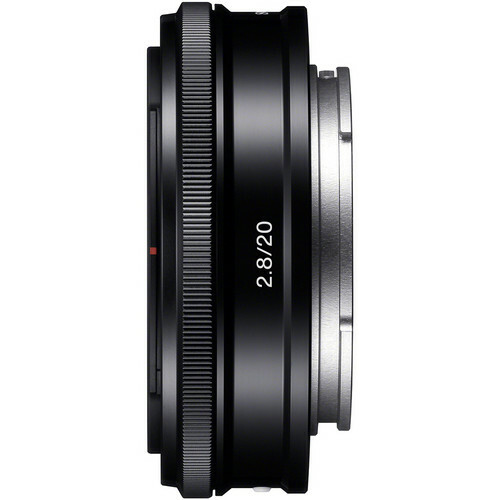 A smooth, quiet internal stepping motor is used for both focus drive and aperture actuation and makes this lens ideal for shooting video. Less than an inch long and built with aluminium alloy, it is both compact and durable. Autofocus and Direct Manual Focus, which allows for precise manual focus even in AF mode, is supported for both photo and video. The aluminium alloy lens barrel is inlaid into a moulded-plastic component for a lightweight yet durable construction. It measures 0.8" (20.4mm) in length and fits well with the compact design of the NEX-system cameras.